Discussions Magazine Music Blog: NAKED EYES: The Reissues! Available on Cherry Pop! NAKED EYES: The Reissues! Available on Cherry Pop! SPAZ reviews the NAKED EYES reissues! No matter what the pretentious critics have said over the years, the early '80s was a wonderful time in music. Punk had given way to New Wave, which in turn gave birth to the Synthpop movement. The charts and record bins were filled with they sounds of synthesizers and pop-alicious melodies galore. From Kraftwerk, Gary Numan and Depeche Mode to The Human League and Heaven 17, Synthpop bands were never in short supply. While guitarists, bassists and drummers complained that these artists were NOT musicians, the synthesizer made it easy for artists to create the songs they heard in their heads and bring them to life. While holding a key down on a keyboard may not have utilized the skills of a trained guitarist, it was the imagination and determination of the Synthpop acts that lead to some of the most ridiculously catchy tunes on the radio. This is not to say that they Electropop acts of the day were not trained musicians themselves - many of them merely switched from piano or guitar to a synthesizer! For many, it was the only way for them to get their songs heard at the time! 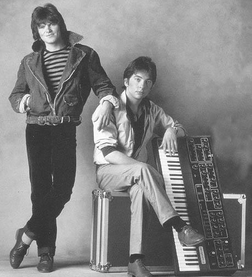 One of Synthpop's sub-genres was the Synthpop Duo. Why use a trio or quartet when all you needed was a talented keyboardist and a vocalist? 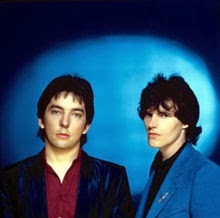 The most famous examples would be Sparks (by the late '70s, they had become a duo! ), OMD, Blancmange, Yazoo and Soft Cell. 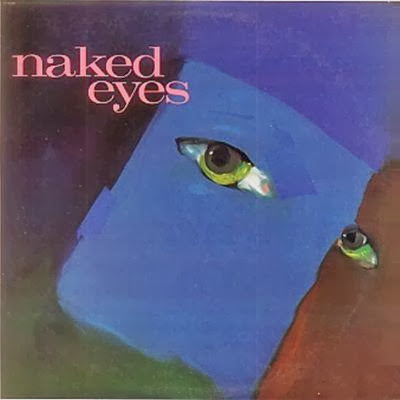 However, one of the most commercially successful in the U.S. was British duo Naked Eyes featuring Rob Fisher on keys and Pete Byrne on vocals (not to be confused with flamboyant nutter Pete Burns from Dead Or Alive). Naked Eyes stood out from the pack because of their image... which was essentially no image at all. Instead of gaining attention with the latest in day-glo fashions and wild hairstyles, they let their music do the talking. Sure, they dressed nice and had coiffed hairstyles, but nothing that made people point and say, "Would you look at that, Martha! Are those boys or girls?" No, Naked Eyes were two normal guys who crafted some of the finest Synthpop of the '80s. The legacy that they would leave behind was their music. 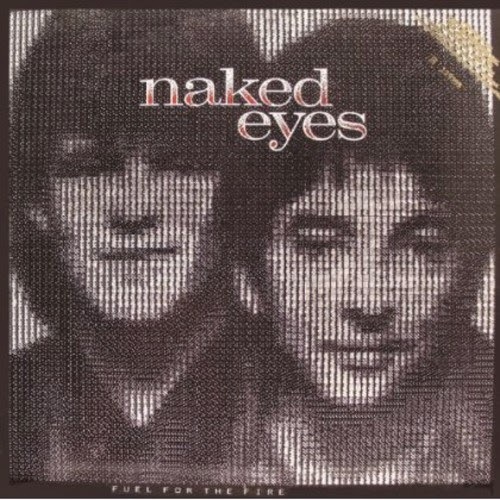 I first became aware of Naked Eyes by chance in 1983. I wasn't reading the UK music magazines much at the time because not every record shop carried them. And besides, I preferred to spend my money on records. Unlike my friends, I would spend my hard earned cash on LPs by bands I'd never heard just because of the label, the producer or the 'look' of the album. I was (and still am) always on the lookout for new music that would give me goosebumps. As for Naked Eyes, I was at Music Market in Costa Mesa and I was perusing their new release wall. It was there that I spied their U.S. self-titled debut album. Not knowing anything about this band, I picked it up and read the album credits on the back cover. Four words made my decide to purchase that album then and there: PRODUCED BY TONY MANSFIELD! I was a huge fan of Tony's band New Musik so buying the album was a no-brainer! I obviously loved Tony's work with New Musik, but I was also a fan of his production on the Captain Sensible solo releases,so obviously I was quite excited about this new album and eagerly anticipated listening to it once I got home! When I first listened to the album, I was in heaven. From the album opener, "Always Something There To Remind Me," to the final track, "Could Be," this was pretty close to Synthpop perfection. Byrne's voice had a touch of McCartney to it, although he was far from a Macca wannabee. Maybe it was just in the lilting melodies and hooks, I"m not sure. But at the same time, he was an 'everyman' - nothing flamboyant or over the top. Fisher's musical arrangements (and Mansfield's production) kept the hooks flowing. The songs that struck me the most were the lovely "Fortune and Fame" and the quirky "Voices In My Head". "Promises, Promises" had the classic New Musik guitar sound (and a great melody to boot). "When The Lights Go Out" and "I Could Show You How" were favorites as well. It was another month or so before I started hearing "Always Something There..." on the radio, but it had some Linn drums added to the intro, which made it more radio friendly. To my knowledge, once the single became a hit, they added that version to the next pressings of the album (and all the collections that have been released ever since). "Promises, Promises" was a big hit as well. 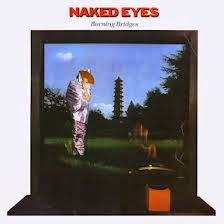 Once I started buying the import singles, I realized that the album that I knew as Naked Eyes was released in the UK as Burning Bridges with a completely different album cover! So, I spent years trying to track an LP down to no avail. To be honest, I never saw a physical copy of the LP in my life. Once I heard that the track order was different, I searched even harder. I'm one of those people who want to hear an album in the original order that the artist intended because it makes for a completely different listening experience. Thankfully, Cherry Pop has reissued Burning Bridges on CD, which is the first time the complete album has been released digitally as it was meant to be heard. The album's running order is different and yes, it does give the album a different feel to the U.S. version. I actually prefer this running order... it has a better flow to it. The version of "Always Something There..." is the original album version sans the added Linn drums on the intro, so that is a bonus for collectors. There are bonus tracks as well including remixes, non-album b-sides and more. A most essential Synthpop album for anyone who digs smart, catchy Pop music with class. I still want to find the LP, though! I haven't looked in ages, but I'd like to own an original just to have it! A year later, the duo released their sophomore album, Fuel For The Fire. Of course, I bought it on the day it came out and rushed home to play it. Mansfield again produced the album, although two tracks, "(What) In The Name Of Love" and "Sacrifice," had been produced by Arthur Baker. The album was yet another slice of Synthpop heaven. Though not as consistently wonderful as their debut, Fuel For The Fire was a worthy follow-up. Surprisingly, the two Baker produced tracks were standouts, although they weren't a radical departure from the first album. Apart from those two tracks, other instantly lovable tracks included "Flying Solo," "New Hearts," and "Eyes Of A Child." Surprisingly, "Once Is Enough" didn't make much of an impact on me at all 29 years ago because when I heard it recently, it was as if I was hearing it for the first time. Of course, now I love it! Again, Byrne and Fisher managed to create flawless Pop music that seemed unreachable yet totally down to earth as well. They were tunesmiths first and foremost. The Synthpop sound they generated was the vehicle in which they chose to drive these songs home in. The Cherry Pop reissue includes bonus remixes, non album tracks and a few demos, all of which make this yet another indispensable slice of Synthpop bliss. While the album is a cohesive, solid release, it didn't do as well as the debut and the band split up before they could make a third album, which is a shame. Rob's later work with Simon Climie (as Climie Fisher) put him back in the charts, but the magic of Naked Eyes was nowhere to be found on Climie Fisher's two albums. Though Pete and Rob remained friends and would start writing together again, hopes for a full fledged reunion were dashed when Fisher died in 1999. Thankfully, Cherry Pop has honored his memory in style with these two fantabulous reissues!